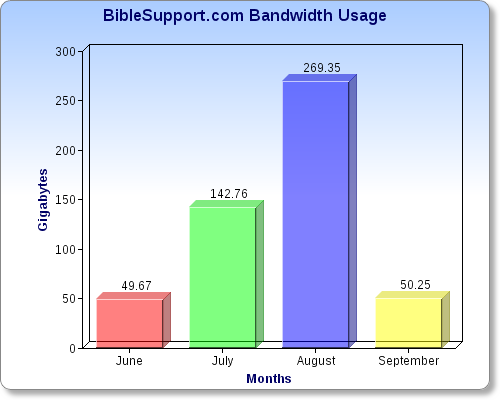 The Lord continues to bless our outreach, as shown by our bandwidth numbers below. Most of our stats are visible from the front page of BibleSupport.com--total number of files downloaded, total members, new members today, etc. One stat that isn't provided is our server bandwidth. As you can see from the chart below, we're serving a LOT of e-Sword and MySword modules! September, a partial month, is also shown above. With less than 5 days into September, and 10 gigs a day so far, we can estimate that September will exceed 300 gigs by month's end. A big thank you to e-Sword.net (Rick Meyers) and DoctorDavet.com (Dr. Dave) for links on their sites, along with Karen Everest for donating e-Sword-users.org to our ministry.